I confess. I love bite-size breakfast. The funny thing is that I never eat on the run. I just like bite sized food. I do not deny that fact. One difficult thing about bite size breakfast foods is that they can kind of be a pain to make. Like a GIGANTIC PAIN. 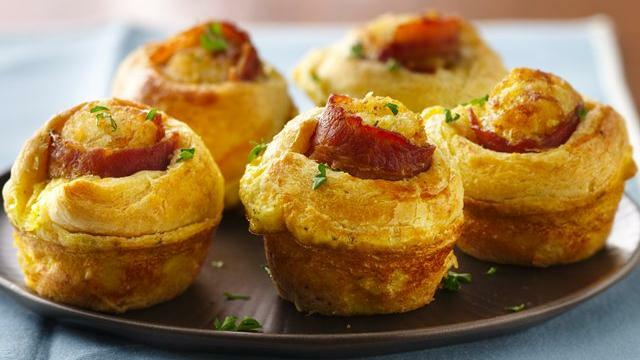 I’ve done recipes like these Bacon-Egg Breakfast Bites from Pillsbury before and sworn that I would never make anything like that ever again. Yet as I am flipping through April’s issue of Bake Off winners, I immediately gravitated to this recipe. As I look at this picture, I remember why. I get to eat bacon and tater tots… for breakfast. Of course, there is no guarantee that my breakfast bites are going to turn out the same way. But they did! Well at least they were very close. Mine don’t seem to have the same lovely golden color of the ones Pillsbury produced. They did make me reaffirm that I don’t want to make anything like this again, though. You’re probably thinking I abandoned my Wilton Portfolio Project with only the first chapter. Not so! I just haven’t written about it, which is silly since this is a blog and it depends on my actually writing stuff after I’ve made it and decorated it. On Mondays, I try to make only Vegan food. It's more than "meatless mondays". There is no dairy, eggs or any animal by-product. This past week, I decided to make Brown Rice Hazelnut Burgers (link takes you to a condensed version of the recipe) out of my Vegan Diner cookbook by Julie Hasson. Looks good, doesn't it? And your probably wouldn't guess it wasn't meat from this picture either. I served it with a side of lentil chips. They were light and crispy and not dry like rice cakes. Don't fear the healthier snacks. Original recipe from Taste of Home: Cupcake, Muffins and More and also found on their website. It was time for me to make my second project from Wilton’s lesson manuals, this time from class number 2 - Flowers and Cake Design. I could have made things a little easier by using a box cake mix, but I decided that I should be testing out cake recipes from scratch if I ever want to do this professionally. I decided on one of my husband’s favorites, carrot cake, and went with this Maple Carrot Cupcake recipe. Don’t these look delicious? I didn’t sprinkle on any of the nuts since by this time I was exhausted from making, frosting and decorating the cupcakes from my lesson manual. My other “complaint” is that my frosting didn’t look like and wasn’t as firm as their frosting was. I come across this a lot and haven’t yet figured out what I’m doing wrong, especially since I’m following the directions closely. Pistachio Baklava Tartlets recipe originally published by Food Network – April 2012. I love baklava, but do not have the patience to make it. I keep thinking about the sticky mess the honey/sugar syrup is going to leave in my kitchen. I’d rather spend the time looking for a baker that makes a good one than scrubbing my kitchen. Yet when I saw this recipe, I was excited to try it! It isn’t baklava, but it’s got all the same flavors and gets it close enough. I have been cooking. It's just that I'm doing it a little at a time. One thing for sure is that our mourning process for one of our pug clean-up crew requires a lot of comfort food and sweets. Be Back Soon... I Promise! I've had a rough week. First, I was working a town fair (having a blast by the way) with the salon I do freelance make-up. Check out the pictures I posed on my sister blog, Day Spa Central, Facebook page. Then my beloved pug (part of the pug clean-up crew) passed away suddenly on Friday. Needless to say, I have been pretty worthless for several days now. I am getting back on schedule and did make some amazing vegan food yesterday, so hopefully I'll get those pictures up soon, as well as my menu for the rest of the week. Thanks for being patient and until I post again... happy cooking!!! I love samples. I really love samples. I am a sample junkie. There, I’ve said it and I feel much better. I get a lot of links to free hair and skin care samples, but occasionally there will be one for food. Like this one I got from Quaker. It was a sample for their new Honey Nut Oatmeal Squares. I happily gave my shipping information and waited patiently for it to arrive. Now, I’ll admit I’m kind of a pessimist. I didn’t expect anything more than a few squares. Just enough to give me a taste leaving me wanting more and sending me to the grocery store in search of a full box. Imagine my surprise – and try my best to admit when I’m wrong – when this box arrived in the mail. I finished this class several weeks ago and just realized that I never wrote this post! It’s a shame too because all of my flowers pulled together nicely. The last class is always final project day and I decided to pull together all the flowers I made (including some more I made during the last week) into bouquets. I was excited to get my Stargazer Lily put together. It is one of the most grown flowers today and if I ever want to take myself seriously decorating cakes, I’m going to need to be able to make this one. You know what today is? It's VEGAN DAY! All dishes came from "Vegan Diner" by Julie Hasson. I'm about at the end of what I want to make in this book, so if anyone has any suggestions for a vegan cookbook, please let me know. I want recipes for breakfast, lunch and dinner. I was supposed to make breakfast, but didn't get up early enough to do so. Not feeling quite myself this week. No matter, this dish is called Blueberry Loaf Cake and worked well for a late afternoon snack and dessert. Ah, the weekend. I often try to take it a little easy on the weekends since I cook a lot during the week. For some reason this weekend, I was incredibly motivated to cook and bake. Okay, well I wasn't motivated ALL weekend. Saturday morning was spent running errands and I wasn't in the mood to make lunch, so we picked something up. I kicked it into high gear for dinner. I got the recipe for Portobello Mushroom Burgers from All You. Initially, I was looking for a Mushroom-Quinoa Burger I found in January's issue, but for some reason it was nowhere to be found on their website. Since I recycle my magazines as soon as I've read them, the recipe has been lost (to me at least) forever. Somehow, I managed to get home without over-indulging in anything other than a soy latte (with whip), but then my lunch seemed lacking. I had planned a salad from the April 2012 issue of Food Network. Yesterday was another busy day that started off right... with breakfast! These Strawberry-Banana Smoothies from Food Network's April 2011 issue were fantastic. The creamy Greek vanilla yogurt was healthy for us and tasted great! Yesterday I decided to take it a little easy on the cooking/baking and make a nice dinner with a drink. For as little as I made, I sure did make one heck-of-a mess in my kitchen. I've heard much bally-hoo about kale. Everyone has wanted me to try it, cook with it, make it into chips... blah blah blah. So this evening I decided to make a Pasta with a Kale and Walnut Pesto. I got the recipe from Real Simple's May 2012 issue. I partnered it with another recipe from that same issue of Real Simple - Spring Lettuces with Avocado Dressing and Pistachios. I'm getting ready to make tonight's dinner and I can't stop thinking about what I made for dinner yesterday. I'm worried I'm going to be disappointed. Of course, I'm getting ahead of myself here... we're talking about yesterday's meals, not about my fears for tonight's dinner. Did that make any sense? Yeah, it didn't on this end either. I honestly don't know what day I'm supposed to be writing about. I think I'm getting punchy. This is a Chai Banana Bread I got from Cooking Light's May 2012 issue. It was moist, very "banana-y" and unlike the muffins I made the other day, had a great hint of chai. I have half a loaf in the fridge and I'm really thinking about munching on a piece while I write this. Side note: I got interrupted while writing this and when I came back, my last sentence read "...while I eat this." I guess I really DO have that bread on my brain. After recuperating over the weekend, I got right back on track with my Meatless Monday. Not just Meatless, but Vegan too. I'm still making my way through Vegan Diner by Julie Hasson. I do have a complaint about the book... not enough pictures. I know that sounds silly, but when you're making your own protein/meat, it would be really helpful to know what the end result is supposed to look like. I've already tried my hand at making meatless-meat and it tasted really good. Today, I was going to make some homemade Rough Rider Barbecue Sauce and make Barbecue Ribz. I was a cooking fool on Friday. I'd like to stress the "fool" part. I slightly overdid it and then was out of commission for the weekend. The good news is that I was back to cooking on Monday and I have a lot of delicious pictures for your consideration. For breakfast, I went with Pistachio-Chai Muffins from Cooking Light. I have to admit, I'm more of a sweet breakfast muffin kind of gal, but my opinion isn't the only one that counts. My husband took well over half a batch to work. He returned with empty containers and said they got a big thumbs up. Well I did "okay" keeping up with posting my meals as I was making them. I didn't do so great in making everything I said I would, but I've got an excuse... I'm lazy. Not the excuse you were expecting? Just keeping it real. I've got the pictures from Friday that will be going up soon, but I wanted to share what I'll be making this week. Wish me luck and I'll be checking in with you later to give you my progress. Until then... happy cooking! I had a lot of things planned for June 7. Then my body decided to not agree with me and I had a pain flare. While my dogs enjoyed me sitting around and napping, I didn't get a lot of cooking/baking done. That doesn't mean I didn't make ANYTHING. It just stopped once I couldn't take it anymore. My morning started off with a smoothie from my archives. Good Housekeeping had this Jump-Start Smoothie in their September 2011 issue. Today I was like a crazy cooking ninja. And there was some alcohol involved. That may explain why my notes are a little difficult to read today. Oh well, let's get to the food. I had a crazy morning and afternoon so my breakfast and lunch dishes had to be rescheduled. It was time to start dinner, but I was parched so I made myself a Pink Lemonade found in All You's July issue. So 2 days in and I already fall behind. Figures. It doesn't mean I haven't eaten in two days. Nope, I've been busily cooking, taking pictures, coating my pug in Fondant... you know, the basics. What? You've never spilled melted marshmallow on your dog before? For the record, I'd highly advise against it. So this day, I made myself a little lunch. I made Bacon Fried Rice from a recipe I got from Cooking.com. If you don't read my blog regularly, let me let you in on a not-a-secret: I LOVE BACON! I overcooked it a wee-bit this time, but it still was delicious.